Long Island bankruptcy lawyer Adam Gomerman offers complimentary consultations for the entire month of January, 2014. Long Island Bankruptcy Lawyer, Adam Gomerman, is pleased to announce complimentary consultation for consumers. Adam Gomerman has years of experience, helping consumers get bankruptcy assistance, and getting the financial advice they need. The law offices of Adam Gomerman provides the following services: Chapter 7 and 13 Bankruptcy assistance, Foreclosure defense, Loan Modification, and stopping wage garnishments. The Law Offices of Adam C. Gomerman is proud to be considered a federally designated debt relief agency assisting our clients in filing for consumer bankruptcy under the federal bankruptcy laws. 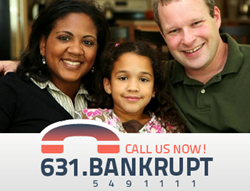 Our experience in bankruptcy law is extensive; we have filed thousands of bankruptcy cases. We are friendly, knowledgeable and affordable and offer easy payment plans.